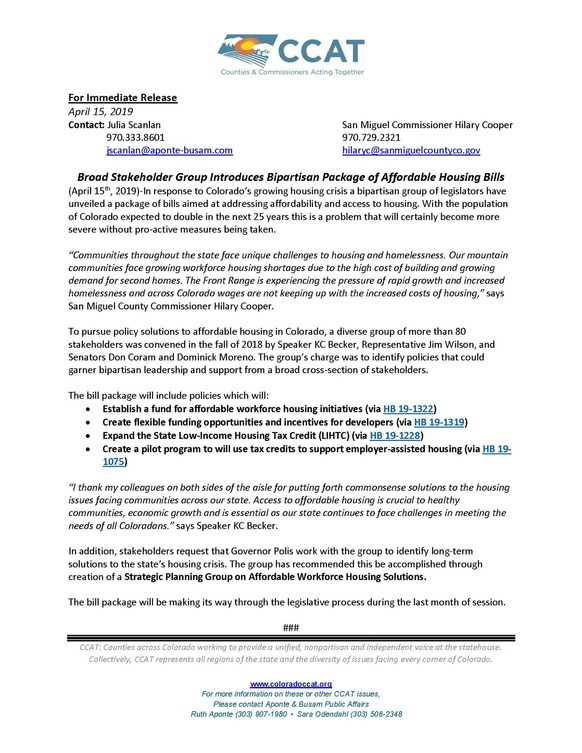 In the fall of 2018, Boulder County participated with diverse stakeholders through the bipartisan group Counties & Commissioners Acting Together (CCAT) in an affordable housing process to identify legislation with broad support to address the affordable housing crisis in Colorado. We know that today, 55,000 people already in our community live in currently severely housing-cost-burdened households, spending more than half their income on housing and having to forgo necessities such as food, health care, and child care. We strongly support the package of legislation and administrative action that resulted from that process, which is described in the CCAT (pronounced "See-Cat") news release issued today. Legislative and administrative support for affordable housing is critical for increasing and preserving safe, affordable housing, which Coloradans across the state identify as a top issue they face. Boulder County Housing Authority (BCHA) has utilized tax credits like the ones in HB19-1228, part of this bill package, to develop affordable housing projects that help seniors, disabled, low-income working families. Our work would not be financially viable without state tax credits and other legislative and administrative resources that increase access to affordable housing for Coloradans. An example of how affordable housing tax credits have provided housing and improved lives is Lafayette’s Aspinwall townhomes whose residents include 24 very low-income, single parent households enrolled in school. In five years, Aspinwall families are guided through a program where they can move from deep dependency to ‘graduate’ into homeownership with an equity account and financial stability. BCHA was also able to pair state tax credits with CDBG Disaster Recovery funds to deliver much-needed replacement housing for families displaced by the 2013 Boulder County floods. Counties & Commissioners Acting Together (CCAT) is a group of counties and individual commissioners across Colorado working to provide a unified, nonpartisan and independent voice at the statehouse.